This is a super simple dish that can make what seems like the most boring vegetables so much more exciting (you may even have a few fooled into thinking it’s a cheese sauce). 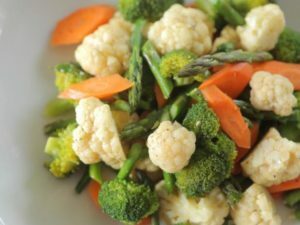 To start with, you can use absolutely any vegetables you like for this dish. Aim for a minimum of 1 cup per person and steam or grill the vegetables until just cooked. 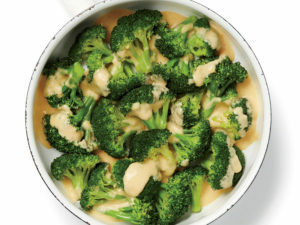 Retaining a bit of crunch is nice with the creamy sauce and it helps retain their vitamins and minerals by not overcooking. For the vegetables, broccoli, cauliflower, zucchini, baby peas, snow peas, carrot, eggplant, capsicum, zucchini, pumpkin, squash, sweet potato, asparagus, corn cobs and brussels sprout are all great choices. Try and choose seasonal, organic where possible, and experiment with different combinations. Prepare and cook your chosen vegetables. Add all of the sauce ingredients into a small saucepan. Over gentle heat stir the sauce consistently until well combined and warmed through. Pour sauce over cooked vegetables and serve.